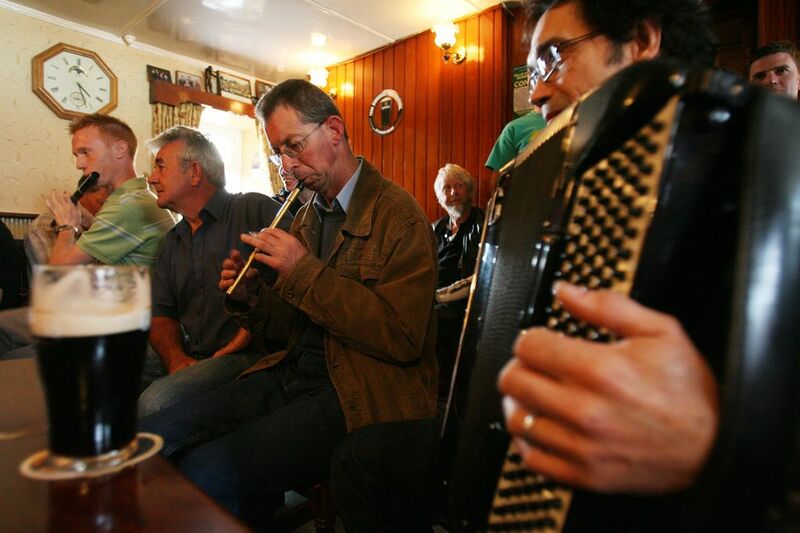 A seisiun takes place during Willie Clancy Summer School in Co. Clare. In recent weeks we have written about the role that fleadh competitions have played over the past half-century in spurring on young people to learn traditional music which may or may not stay with them as they age or move onto other interests. What has been proven to be more enduring for all ages are dedicated classes where one can study technique and learn tunes and hone their skills. Summer schools and long weekends that provide a total immersion in Irish music in classes, lectures, concerts and pub sessions do the job quite nicely and have for decades and still seem to be proliferating both in Ireland and in North America. Here is a brief survey of some worth noting. It isn’t just my Clare heritage suggesting that it all begins with Scoil Samhraidh Willie Clancy (Willie Clancy Summer School or Willie Week) that is celebrating its 40th anniversary this year July 6-13. The famed West Clare festival honors the late uilleann piper from Miltown Malbay and musicians of his generation who held fast to the tradition until others came along to embrace it. Stewarded by the late Muiris O Rochain for 39 years and others, the WCSS has the most number of teachers and classes in all instruments and sparked the set dancing revival in 1982 when they added classes. It is known all over the world as students come regularly from many countries and has put Miltown Malbay on the map as the Mecca of Irish music each year. A new DVD marking the anniversary, Scoil Samhraidh Willie Clancy, has been produced by Martin O’Malley (www.malbayfilms.ie) touting the legacy of Willie Week and its ethos which has permeated to all the other summer schools in some fashion or another. Following on the heels of that festival are the South Sligo Summer School in Tubbercurry, Drumshambo in Leitrim, Meitheal in Limerick and Scoil Acla in Mayo and, of course, Scoil Eigse in Derry this year before the Fleadh Cheoil na hEireann. All good choices to go a-gathering tunes in Ireland this summer. For 18 years I was associated with the Catskills Irish Arts Week in East Durham as a founding consultant and teacher and artistic director. That came to an end at the beginning of the year, but not before witnessing the successful transformation of a fading Irish American Catskills resort town into the North American equivalent of Willie Week in the opinion of many. It still boasts the most number of top notch teachers and performers from Ireland and North America of any North American summer school in its 19th year (July 14-20). Visit www.catskillsirishartsweek.com. Down in the beautiful hills of West Virginia, Dr. Mick Moloney started an Irish music week at Davis and Elkins College as part of the Americana folk programming produced by the Augusta Heritage Center, and it still continues today under the artistic direction of Dr. Dan Neely based in New York. With a carefully selected teaching staff and a mix of classes and programming, the campus-based Irish/Celtic Week (July 21-26) is not only educational and fun, but a bonding week for those who head to the hills each year. Visit www.augustaheritagecenter.org. Another well regarded campus summer school series is the Swannanoa Gathering (www.swangathering.com) in Ashville, North Carolina down along the Blue Ridge Mountains which hosts one of the premier Irish/Scottish programs called Celtic Week in North America. Director Jim McGill brings in top talent each year for the successful program which like the others allows for round the clock interaction between the students and faculty. It shares the same week with Catskills Irish Arts Week (July 14-20), which allows for a geographic if not an artist driven choice. Outside of Washington, D.C. the O’Neill-Malcom branch of CCE has been running a growing week of music and dance instruction called MAD Week (Musical Arts and Dance) taking place July 8-12 in Bethesda, Maryland. A sign of the vitality and interest in the greater D.C. area, this day school approach at the Cedar Lane Unitarian Church attracts a high-powered staff and developing student base annually under the directorship of Mitch Fanning. Details at ccepotomac.org. In the Midwest, the venerable Milwaukee Irish Fest has been running its own summer school program preceding its Irish Fest weekend (August 12-18) availing of many terrific teaching performers who participate in the largest Irish festival in the country. Increasingly they add classes that add or introduce facets of Irish culture that reaffirm the huge educational mission this highly successful and well-organized festival organization produces every year. They offer a variety of sampler classes for folks coming in at week’s end to take in Irish Fest as well. Visit www.irishfest.com. There are also a couple of fledgling programs in two cities where Irish music instruction and performance are notable, one a long-time bastion of Irish traditional music and the other relatively recently. For the third year the Francis O’Neill Irish Arts Week (something about the title rings familiar) is hosting an instructional program of music and dance organized by Sean Cleland and Oisin MacDiarmada through the Irish Music School of Chicago. Again, it is organized a day school through one of its sponsors, fittingly enough the Francis O’Neill Pub and Restaurant on Chicago’s North Side and it takes place July 20-28. Coming up shortly is the Minnesota Irish Music Weekend June 13-16 (MIM) organized by the St. Paul-based Center for Irish Music a solid, grass roots music instructional organization with a sense of where it is heading. Though it is only a weekend program, its tastefully recruited list of instructors and performers, including some top-tier musicians from Ireland, services a younger and improving Irish music community there so it merits a mention for its contributions to strengthening the overall Irish music community in the Midwest. In St. Louis, there is a cultural immersion program for children organized by St. Louis Irish Arts directed by Helen Gannon that runs from June 3-27, serving to educate local youth not only in their Irish music and dance heritage but Irish Culture in general. Visit www.slia.org. There are new Irish and Celtic weeks or total immersion weekends for Irish music and dance in the instructional vein cropping up all the time in these very fertile Green Fields of America. One really important aspect of all of them in my observation has been the ability to blend the needs and interests of younger people starting out on this path with those of older generations which is the foundation of the Living Tradition of Irish music. That musical heritage belongs to all of us and is ours to preserve for future generations. I like what I see and have experienced over the past half-century in making it a robust and important part of our Irishness.